Luc Besson was, at one time, one of my favorite directors. I was blown away by La Femme Nikita and Leon and fell in love with the cheesy sci-fi stylings of The Fifth Element. I even liked Subway. But lately I have not been very impressed with his ouevre as a director (his writing credits stand up a bit better in the Oughts though). But his recent project has caught my attention once again. 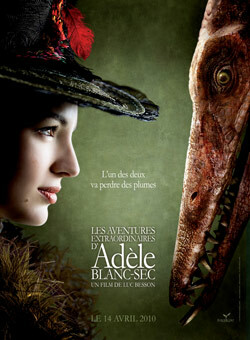 Les Aventures Extraordinaires D’Adele Blanc-Sec is a movie that is as strange as they come. The movie, which will star Louise Bourgoin, is set in 1912 and tells the story of a young reporter, Adele Blanc-Sec, who is like an Indiana Jones archetype who battles with corrupt politicians, crooks, scientists and devil worshippers. In this movie, she battles what may probably be her biggest nemesis, a pterodactyl that sows terror on Paris. Yes, you read it right, a pterodactyl. I am so watching this movie. I am also fan of Luc Besson. Still has impact of his greatest movies Leon and The Fifth Element. 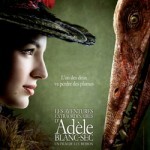 Les aventures extraordinaires d’Adèle Blanc-Sec is also good movie, but i am waiting for Section 8.